Paris Hilton & Captain Beefheart, a new record by Knights of Infinite Resignation was released this week on the Next Best Records label. The record was inspired by this picture of Paris Hilton holding a copy of Trout Mask Replica which you may remember we mentioned about a year ago. Since that time the image has been reproduced at countless websites and blogs. Screenshots of some of these reproductions were even used in a video. The photograph has been a source of much wonder and speculation, astonishment and disbelief, and not least mirth and dismay. Could Paris Hilton, icon of everything shallow, really appreciate the complexities of Trout Mask Replica? 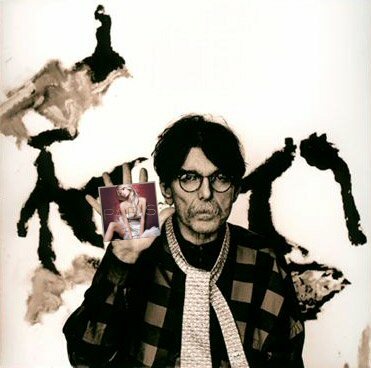 For some fanatics Captain Beefheart’s iconic album is at the opposite end of the musical and cultural spectrum from Paris Hilton’s world. “Cognitive dissonance” and “cultural juxtaposition” are just two of the less rude comments which have been applied to the image. Although the singer on this record is no Jan or Dean the songs hook is more than equal to the best of surf music . The chorus line, “Paris Hilton and Captain Beefheart” is so catchy and is used so humourously that once heard it is very hard to shake off. This might just make the record essential listening for more than Captain Beefheart (or Paris Hilton) trivialists. Another self-penned song completes the release which is downloadable from your local digital retailer. A cover of Pere Ubu’s Ice Cream Truck is included on the CD.